Last week we talked about Amaterasu – the godess of the Sun, and the main diety of the Shinto religion. In that text we also mentioned her brother and husband Tsukiyomi (the God of Moon and Night). Today we take a closer look at her other brother: Susanoo. 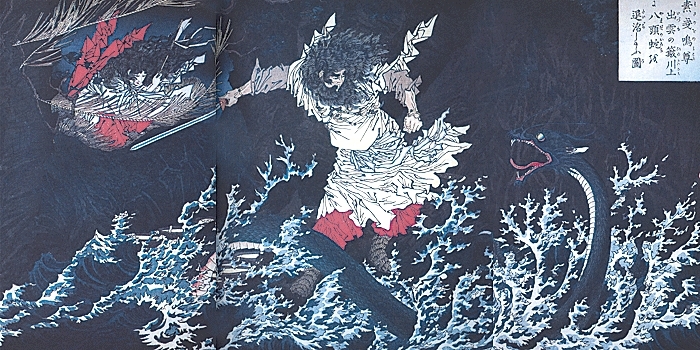 Susanoo (須佐之男) is the Shinto god of seas and storms. He is also known as “the Powerful Storm of Summer”. As we mentioned in the post about Amaterasu, she and her brothers were born when their father Izanagi purified and washed himself after having gone through the underworld. Amaterasu and Tsukiyomi were born out of Izanagi’s left and right eye respectively, and Susanoo was born from the nose. 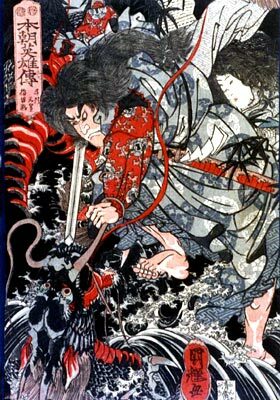 Susanoo also had a famous sword known as Totsuka-no-Tsurugi (十拳剣 “Sword with a length ten times it’s handle”), or also called Orochi-no-Aramasa (蛇之麁正). 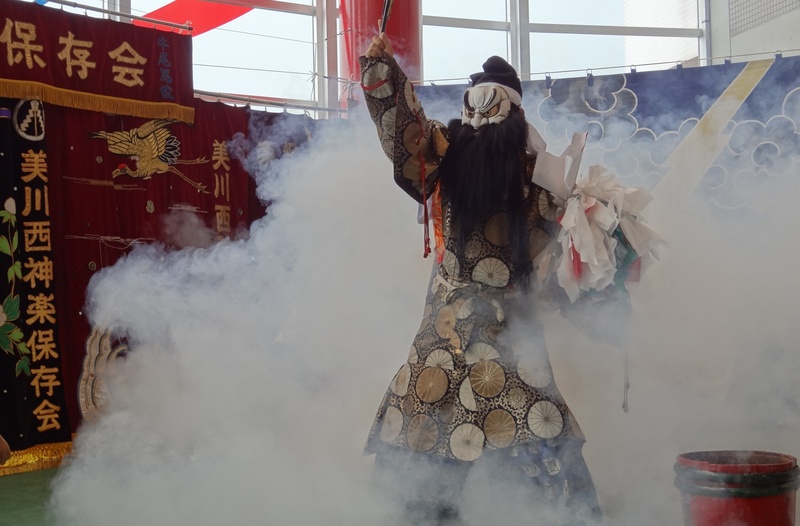 As with most of he stories about the Shinto gods, the oldest sources are the Kojiki (古事記) and the Nihon Shoki (日本書紀). These two chronicles speak of a long-standing rivalry between Susanoo, and his sister Amaterasu (like with most brother-sister relationships, perhaps?). One day, Susanoo was told to leave heaven, and before leaving he went to bid his sister farewell. She was suspicious of Susanoo’s motives, and in order to convince her about his sincerity, Susanoo challenged her to a bet. They each took one thing from the other, and from that object they summoned new gods and goddesses. Amaterasu created 3 goddesses out of Susanoo’s sword, and Susanoo created 5 gods from Amaterasu’s neckless. Amaterasu then claimed that the 5 gods were hers, because they come from her neckless, she thought she had won, but Susanoo then claimed himself the winner as his sword had created goddesses. Another story about the relationship between the two sibling gods is one where Susanoo grows restless, and in a fit of rage goes berserk. While wrecking havoc upon everything around him, he destroys Amaterasu’s rice fields, and killes her servants, among other things. This causes Amaterasu to go and hide in a cave for some time, and there is no sun. In the end she is persuaded to come back out, and Susanoo is banished from heaven, and he traveled to the province of Izumo, in the east part of today’s Shimane Prefecture. Here he meets a family, headed by an old man by the name of Ashinazuchi, who tells Susanoo about the eight-headed, and eight-tailed, snake called Yamata-no-Orochi (八岐の大蛇). The family used to have 8 daughters, but the snake had eaten all but one, and he was soon coming back for her. Susanoo decided to help the family, if he was allowed to marry the last daughter: Kushinada-Hime. They married, and Susanoo turned her into a comb, to be able to have her close to him while battling the giant snake. He built a huge fence, with eight gates in it. Behind each gate he placed a huge barrel of sake. When the snake came, he put one head through each of the gates, and drank the sake, and fell asleep. While being knocked out, Susanoo could easily cut of the heads of the snake, and its tails. And in the forth tail, he found a sword, that he would later give to Amaterasu as a reconciliation gift, and be allowed back into heaven. This sword later became known as the Kusanagi-no-Tsurugi (草薙の剣), and is one of the Japanese Imperial Regalia. In popular culture, Susanoo can be found in many different games, mangas, and animes: In “Naruto”, the Uchiha family can use their strongest ocular power, the Mangekyo Sharingan, to summon a powerful diety named Susanoo; in the video game “Puzzle & Dragons”, Susanoo is a collectible god; in the video game “Okami” he is one of the protagonists; he showed up in the card game “Android: Netrunner” from Fantasy Flight Games; and he appears in the tabletop roleplaying game “Scion”. As you can see, Susanoo is a rough, wild character, who isn’t even afraid of his sisters wrath, and who carries out both great deeds of heroism, as well as acts of vandalism. A great warrior, well worthy the title God of Seas and Storms. “Nihon ryaku-shi”, where Susanoo is depicted.